GEHRIMED and American HealthTech partner to help advance the state of technology in the long-term/post-acute care (LTPAC) community. The partnership enables data exchange between the practitioner’s EHR (GEHRIMED) and the facility’s EHR (American HealthTech). ASHEVILLE, N.C. (PRWEB) JANUARY 04, 2018 — GEHRIMED, the creator of the first Stage-2-Certified EHR designed exclusively for Long-Term/Post-Acute Care (LTPAC) practitioners, and American HealthTech a leading provider of clinical, financial, and revenue cycle software and services to skilled nursing and senior living organizations across the country, announced today the formation of their strategic partnership, to help advance the state of technology in the LTPAC community. The partnership enables data exchange between the practitioner’s EHR (GEHRIMED) and the facility’s EHR (American HealthTech). The partnership was formed in response to the need for a more comprehensive and secure solution that would support instant-access to patient information, strengthen communication between long-term care practitioners and facilities, and address the rapidly changing regulatory requirements. 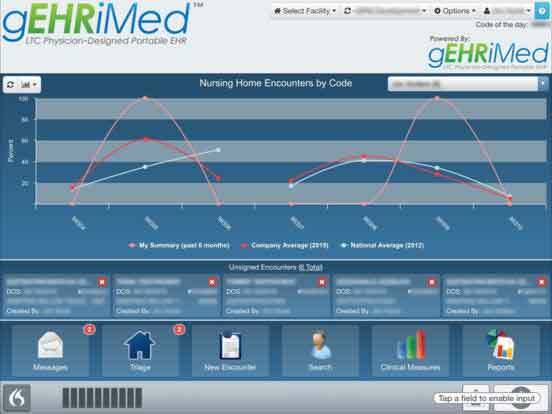 This is GEHRIMED’s third partnership with a facility EHR vendor to provide a nationwide, secure solution that bridges the gaps in interoperability, communication, and operations between on-site and off-site care practitioners. LTPAC care teams face the unique challenge in that, most long-term care practitioners do not work for a single facility, instead they are part of “Virtual Healthcare Teams,” visiting multiple facilities. Currently, practitioner EHRs and facility EHRs are disparate systems with restricted data exchange and communication. This could leave the practitioner and the facility without sufficient and accurate data to provide the best care and services possible. The partnership provides real-time patient data exchange between the medical practitioner’s EHR (GEHRIMED) and the facility’s EHR (American HealthTech) allowing the members of the Virtual Healthcare Teams to remain connected and easily access secure and up-to-date patient information. The solution reduces the need to share patient information via phone calls and faxes, which can lead to insufficient and inaccurate data. Equipping practitioners with real-time patient data helps support critical clinical decision-making, resulting in enhanced patient outcomes and quality patient care.